Horsing around: Crystal Bennes and Tom Jeffreys write a rhyming review of Red Bridge’s production of Black Beauty. Parked by the side of a road. Place to call their abode? In the form of a pantomime horse. He dances a mighty fine waltz. Much more than a horse on the stage. Since they saddled up and said “neigh” for a wage. To flog all the stuff that they own. They find a tatty old book that’s well known. Black Beauty it’s called! You can tell from the title. The tale of a famous black horse. Of this tale with a moral, of course. Using handbags and boxes and boots. And the audience respond with great hoots. The other by John Currivan. And together we’re all having fun. The Traverse suggests six and over. Even the oldies here are in clover. Must pack up and move on their show. First Manchester, then on to Glasgow. Then get thyself down to Black Beauty! 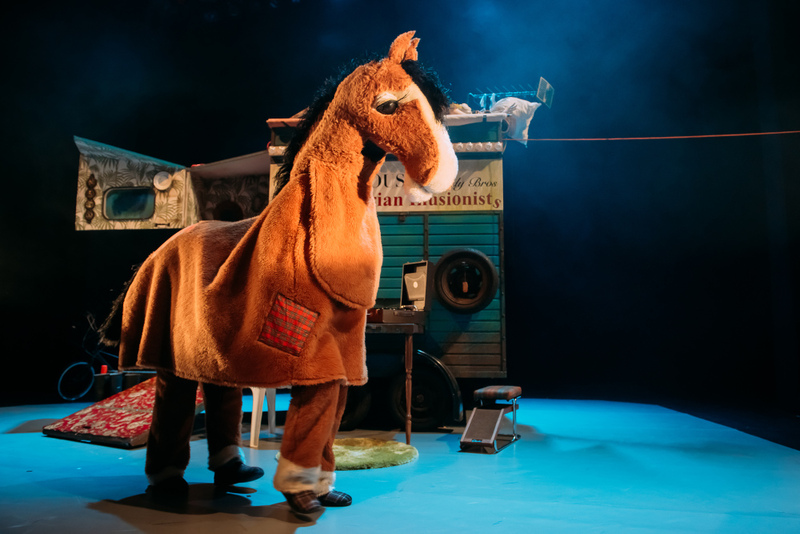 Black Beauty was on at the Traverse Theatre, Edinburgh from 29-30 November. It is touring until 23 December. More info here.